The Mekong expedition of 1866–1868, conceived and promoted by a group of French colonial officers and launched under the leadership of captain Ernest Doudard de Lagrée, was a naval exploration and scientific expedition of the Mekong River on behalf of the French colonial authorities of Cochinchina. Its primary objective, besides scientific documentation, mapping, and the mission civilisatrice, was an assessment of the river's navigability in order to link the delta region and the port of Saigon with the riches of southern China and upper Siam (modern day Thailand). Ambitions were to turn Saigon into a successful commercial center such as British controlled Shanghai at the mouth of the Yangtze River. Political objectives were heavily influenced by 19th century Anglo-French geo-strategic rivalries, namely the consolidation and expansion of French colonial possessions, the containment of Britain's colony of Upper Burma and the suppression of British economic interference on the Southeast Asian subcontinent. Over the course of two years the expedition, which came to be known as the Mekong Exploration Commission traversed almost 9,000 km (5,600 mi) from Saigon through 19th century Vietnam, Cambodia, Laos, Thailand, and Myanmar into China's Yunnan Province, finally arriving in Shanghai and mapping over 5,800 km (3,600 mi) of previously unknown terrain. Despite its explicit political and economic connotations, long after the classic Age of Discovery and the disappointment over the river's unsuitability as a trade highway, the expedition gained highest acclaim among scholars, in particular the Royal Geographical Society in London and "holds a special place in the European annals of discovery" as the first to reveal the Mekong valley region, its people, and southern China to Europeans. Having relieved the Siege of Saigon, Admiral Léonard Charner proclaimed the formal annexation of three provinces of Cochinchina into the French Empire on 31 July 1861. The event marks the beginning of the colonial era of France in Southeast Asia, followed by the founding of French Cochinchina in 1862 and the French protectorate over Cambodia in 1863. The government in Paris maintained a more realistic idea on these acquisitions than most of its colonial entrepreneurs as it became clear that Cochinchina was "...not to be a jewel in the French colonial empire." It had rather become a liability and the Ministry of the Colonies pondered options of retreat, strictly based on scholars' reports in French Indochina who measured Saigon's commercial success against British Singapore and Shanghai. Contrary to these sober official conclusions, the lucrative trade of these two ports and the economic links to China via the Yangtze motivated the French colonial community in Saigon to speed up surveying the Mekong. Since 1857 a number of colonial officers seriously voted for a mission "into the unknown lands north of the Mekong delta", arguing that their "government underestimated the importance of such an expedition for the continuance of French colonial power." The eventual conquest and colonisation of northern Vietnam and the establishment of a solely French-controlled trade route to China were considered necessary objectives as the vast Chinese empire with its enormous market was to become a potential source of a great commercial opportunity. Francis Garnier, the most ardent supporter of the expedition wrote "For a long time the gaze of the colony had been cast with curiosity and impatience towards the interior of Indo-China which was shrouded in great mystery." Louis de Carné, the youngest expedition member also pointed to the unknowns: "Uncertainty begins within two degrees of Saigon, the very inexact charts of the great river; beyond that, only misleading geography instead of serving it." An earlier campaign, launched in Burma in 1837 by the British army officer Captain McLeod, who had travelled up the Salween River along the border to Thailand was considered proof of British rivalry and ambition. Only the refusal of Chinese authorities to allow him passage through Chinese-controlled territories ended McLeod's mission. Although unsuccessful, the event spurred fears that the British were about to win the race and close off Chinese trade to the French. Some historians, such as the Dutch author H.Th. Bussemaker have argued that these French colonial undertakings and acquisitions in the region were mere reactions to or counter-measures against British geo-strategy and economic hegemony. "For the British, it was obvious that the French were trying to undercut British expansionism in India and China by interposing themselves in Indochina. The reason for this frantic expansionism was the hope that the Mekong river would prove to be navigable to the Chinese frontier, which then would open the immense Chinese market for French industrial goods." In 1865, the colonial governor of Saigon, Admiral Pierre-Paul de la Grandiere, won approval for the expedition from a reluctant Ministry of the Navy and the Colonies in Paris. "Throughout 1864, the French government had vacillated over whether to sustain their colonial possession in southern Vietnam or to abandon" this so far costly venture. On his return to Saigon, the governor appointed the members of the Mekong Exploration Commission (or The Exploration Commission, fr. : Commission d'exploration du Mékong) on 1 June 1866. 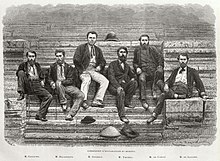 Author John Keay provides a vivid image of the departing party in "The Mekong Exploration Commission, 1866–68: Anglo-French rivalry in South East Asia": "In two minuscule steam-driven gunboats, with an inordinate quantity of liquor, flour, guns and trade goods, plus all the trappings of a major scientific expedition, the Commission cast off from the Saigon waterfront and headed upriver into the great green unknown on June 5, 1866." Detouring into the Tonle Sap, the first stop was to be the ancient ruins of Angkor, which Henri Mouhot first had described in his pamphlet in 1861. The temple ruins, "a highlight for the expedition's members, served as an important point of remembrance for the expedition as the discovery had created a popular mania around the prospect of a newly-discovered ancient civilization in the Far East." Disappointment soon set in after the expedition left the temple ruins, as only a few days later the men reached the Sambor rapids upstream of Kratie, the Prépatang and the Khone Falls in southern Laos, where at the Si Phan Don Islands the river splits into numerous channels with formidable rapids, waterfalls, currents and cataracts. At the Khone Falls, the men realized that the river was not at all navigable for any merchandise transport vessel and the steamboats had to be left behind. Still, the mission spent a week studying the falls, hoping to find a point where an average-sized river boat might be able to pass the cataracts or otherwise, whether the establishment of a lateral channel would be feasible. In spite of the "determination to put the stream to work, the Mekong was not yet a river to be tamed". Garnier found himself on a river that "would simply not cooperate." He concluded that, "The future of rapid commercial relations on this vast river, the natural route from China to Saigon, of which I had happily dreamt the previous evening, appeared seriously compromised to me from this moment on." On top of that, Captain Doudart de Lagrée had learned at the Cambodian court, that further upstream was another succession of rapids, between Pak Moun and Kemarat, around a hundred kilometers long, known as the Tang-Ho rapids or the Falls of Kemarat, where the river constitutes the border between modern day Ubon Ratchathani Province of Thailand and Savannakhet Province, Laos. At Hui-tse, south of Dali in China, the mission reached its climax in the death of the expedition's leader, de Lagrée, on 12 March 1868 after the health and condition of the men had begun to seriously deteriorate and malaria was widespread north of Luang Prabang near the Chinese frontier. At Ssu-Mao, Yunnan the travellers were halted by the Panthay Rebellion and faced the dilemma of whether to continue exploring the Mekong, or to conduct a commercial survey of southern China and abandon the river. Carné wrote: "We were compelled by the Mussulman revolt to leave the Mekong, in order to gain the Sonkoi; to abandon geography, and solve a problem of more practical and immediate importance" and "At this moment, the commercial question won out as the impracticalities of continuing the scientific mapping of the Mekong became apparent." Francis Garnier took command of the mission after de Lagrée died and he safely led the expedition to Shanghai and the Chinese coast via the Yangtze River. The records made over the course of two years "filled a thousand pages, and included surveys, observations, logs of food purchases, bottles of wine on board" and served as basis for subsequent travels. The Red River and its valley became the focus of renewed reconnaissance activities in order to find a commercial entrance into China for the French colonial empire. Just by accident the mission had discovered the potential of the Red River (Chinese: Hồng Hà, Vietnamese: Songkoi or Sông Cái), which flows from Dali in Yunnan across south-western China and Tonkin and exits via Hanoi and Haiphong into the Gulf of Tonkin. In 1872 de Carné wrote, [The Red River] "...promises to realize all the hopes and expectations which the Mekong destroyed..."
Francis Garnier received an award to be shared with David Livingstone at the 1869 Geographical Congress in Antwerp. In 1870 he received the prestigious Patron's Medal of the Royal Geographical Society in London, the highest award an explorer of any nation could possibly receive. The institution's President Sir Roderick Murchison stated, "...France has the fullest right to be proud of these doings of her gallant naval officers..." Garnier continued his travels in the service of French Indochina, trying to discover whether the Red River might be the desired route for trade with China. Colonial civil servant, explorer, and diplomat Auguste Pavie led four missions between 1879 and 1895, covering 676,000 km2 (261,000 sq mi) on foot, by elephant, or down the river on rafts, producing more accurate scientific data, such as the first atlas of the Mekong and at least six volumes of observations. Further surveys, military missions and expeditions followed, which helped to create the strategic and logistical framework for the successful French colonial acquisition of Tonkin and Annam in 1884, culminating in the establishment of the Indochinese Union in 1887, territorial losses for Siam, and the Treaty of Bangkok in 1893, which, among other things, resulted in the French protectorate over Laos and Cambodia as the Mekong constituted the border between France and Siam over the course of almost 1,500 km (930 mi). Passage up the Mekong past the Khone Falls was made in the mid-1890s by specially designed French steamboats, the Massie and the Lagrandière (named after governor Pierre-Paul Grandière). There had been unsuccessful attempts by other steamboats in the early-1890s to go up the falls via the river, but these two new vessels were dismantled and both taken over temporary rails and carried across Khone Island in a "prouesse d'acrobatie nautique" ("a feat of nautical acrobatics"). Pierre-Paul Lagrandière's journey up the river in 1895 was ultimately terminated at the Tang-ho rapids (also called Kemarat Falls, 145 km (90 mi) of raging white water in the former Shan State, where modern day Myanmar borders Laos), and neither of the two vessels tried to ascend the river again. In 1897 a new railway was built on Khone Island, rendering passage past the Falls of Khone much easier until the line finally fell into disrepair in the 1940s. Plates from Delaporte's drawings, in which certain features—ruins, wild animals and enormous trees—are exaggerated in order to match and satisfy 19th century European tastes for the romantic helped to keep the commission in the public's mind. The drawings were widely reproduced, even to this day, on prints, postcards, calendars and tourist brochures, as well as gracing the walls of many of the better hotels in Southeast Asia. ^ "Ernest-Marc-Louis Doudart de Lagrée". Encyclopædia Britannica Online. Encyclopædia Britannica, Inc. Retrieved April 3, 2015. ^ "A Historic Mekong Journey". Fishbio. November 27, 2013. Retrieved April 3, 2015. ^ "Colonial Era – Cambodia Enters the Wider World: 1863 – 1953 Cambodian History Searching for the Truth, July 2009 By David Chandler". NORTHWESTERN UNIVERSITY SCHOOL OF LAW CENTER FOR INTERNATIONAL HUMAN RIGHTS AND DOCUMENTATION CENTER OF CAMBODIA. Retrieved November 25, 2015. ^ Dunmore, John (April 1993). "The French Voyages and the Philosophical Background". Tuatara. Victoria University of Wellington Library. 32. Retrieved April 3, 2015. ^ a b Keay, John (November 2005). "The Mekong Exploration Commission, 1866 – 68: Anglo-French Rivalry in South East Asia" (PDF). Asian Affairs. Routledge. XXXVI (III). Retrieved April 3, 2015. ^ "Garnier, Marie Joseph Francis (1839-1873) Voyage d'exploration en Indo-Chine effectué pendant les années 1866, 1867, et 1868 par une Commission Française présidée par M. le Capitaine de Frégate Doudart de Lagrée". Donald A. Heald. Retrieved April 3, 2015. ^ Chapuis, Oscar (January 1, 2000). The Last Emperors of Vietnam: From Tu Duc to Bao Dai. Greenwood Publishing Group. p. 48. ISBN 9780313311703. Retrieved April 3, 2015. ^ "Vietnam - Table A. Chronology of Important Events". Country Data. Retrieved April 3, 2015. ^ Osborne, Milton (December 1, 2007). The Mekong: Turbulent Past, Uncertain Future. Grove Press. p. 101. ISBN 9780802196095. Retrieved April 3, 2015. ^ Moth, Lem Chuck (September 1, 2011). "The Kingdom of Cambodia". Khmer Heritage. Retrieved April 3, 2015. ^ MAURICE ROBERT de SAINT VICTOR. "THE FRENCH OFFICERS: CRAFTSMEN OF THE CONQUEST AND PACIFICATION OF TONKIN (1871-1897) p. 20" (PDF). U.S. Army Command and General Staff College. Retrieved December 13, 2018. ^ a b Wong, Soo Mun Theresa (2010). "Making the Mekong: Nature, Region, Postcoloniality". Ohio State University. Retrieved April 3, 2015. ^ Osborne, Milton (1999). River Road to China: The Search for the Sources of the Mekong, 1866-73. Atlantic Monthly Press. p. 44. ISBN 9780871137524. Retrieved April 3, 2015. ^ Harvey, G.E. (July 1, 2000). History of Burma. Asian Educational Services. p. 382. ISBN 9788120613652. Retrieved April 3, 2015. ^ Mukherjee, Rila (2011). Pelagic Passageways: The Northern Bay of Bengal Before Colonialism. Primus Books. p. 416. ISBN 9789380607207. Retrieved April 3, 2015. ^ Bussemaker, H.Th. (2001). "Paradise in Peril. Western colonial power and Japanese expansion in South-East Asia, 1905-1941". University of Amsterdam. Retrieved April 3, 2015. ^ Filippi, Jean-Michel (June 17, 2013). "Angkor, before and beyond". Kampotmuseum. Retrieved April 3, 2015. ^ "Ernest Doudart de Lagrée". Angkor Wat Online (in French). Retrieved April 3, 2015. ^ a b Marie Joseph Francois Garnier. Encyclopædia Britannica. Encyclopædia Britannica Inc. 1911. Retrieved April 3, 2015. ^ Savès, Joseph. "Francis Garnier victime des 'Pavillons noirs'". Herodote.net (in French). Retrieved April 3, 2015. ^ "La Perle de L'Indochine". Cap sur le Monde (in French). Retrieved April 3, 2015. ^ "Louis Delaporte". Carnet d'escale (in French). Retrieved April 3, 2015. ^ a b "Clovis Thorel". Medarus (in French). Retrieved April 3, 2015. ^ a b "La première expédition française du Mékong. (1866-1868)". Grande(s) et petites histoires de la Thaïlande (in French). November 13, 2014. Retrieved April 3, 2015. ^ "Henri Mouhot". Angkor Wat Online (in French). Retrieved April 3, 2015. ^ "Henri Mouhot". Encyclopædia Britannica Online. Encyclopædia Britannica, Inc. Retrieved April 3, 2015. ^ "Kemarat: Thailand". Geographical Names. Retrieved April 3, 2015. ^ Mekong. Encyclopædia Britannica. Encyclopædia Britannica Inc. 1911. Retrieved April 3, 2015. ^ Enriquez, Colin Metcalfe (1918). A Burmese loneliness: a tale of travel in Burma, the Southern Shan States and Keng Tung. Thacker, Spink and Co. p. 151. Retrieved April 3, 2015. ^ Enriquez, Colin Metcalfe (1918). A Burmese loneliness : a tale of travel in Burma, the Southern Shan States and Keng Tung. Thacker, Spink and Co. pp. 150–151. Retrieved April 3, 2015. ^ "Explorations in Cambodia". The Friend (1 ed.). 33 (10). October 2, 1876. Archived from the original on April 2, 2015. Retrieved April 3, 2015. ^ Choi, Jiwon (June 2009). "History of Muslims under Chinese Rule, since 1839". Retrieved April 3, 2015. ^ "Francis Garnier". Encyclopædia Britannica Online. Encyclopædia Britannica, Inc. Retrieved April 3, 2015. ^ "Exploration Travel Indochina". Vorasith Online. Retrieved June 20, 2015. ^ Nakamura, Tamotsu (August 2001). "Quest for the Source of the Mekong River" (PDF). The Japanese Alpine Club. Retrieved April 3, 2015. ^ Ooi, Keat Gin (January 1, 2004). Southeast Asia: A Historical Encyclopedia, from Angkor Wat to East ..., Volume 1. ABC-CLIO. p. 539. ISBN 9781576077702. Retrieved April 3, 2015. ^ Mitchell, Rosemary, ed. (July 26, 2013). "13". Mutual (In)Comprehensions: France and Britain in the Long Nineteenth Century. Cambridge Scholars Publishing. p. 254. Retrieved April 3, 2015. ^ "Medals and Awards" (PDF). Royal Geographical Society. Archived from the original (PDF) on September 27, 2011. Retrieved April 3, 2015. ^ "L'Homme". Auguste Pavie (in French). Archives nationales. Retrieved April 3, 2015. ^ "Full text of " Pavie Mission, Indo-China, 1879-1895". Internet Archive. Retrieved May 13, 2015. ^ "Indochinese Union". Encyclopædia Britannica Online. Encyclopædia Britannica, Inc. Retrieved April 3, 2015. ^ LePoer, Barbara Leitch, ed. (1987). "The Crisis of 1893". Thailand: A Country Study. Library of Congress. Retrieved April 3, 2015. ^ Martin, Marie Alexandrine (1994). Cambodia: A Shattered Society. University of California Press. p. 31. ISBN 9780520070523. Retrieved April 3, 2015. ^ Smithies, Michael (March 8, 2010). "The great Lao buffer zone". The Nation. Archived from the original on 2015-04-02. Retrieved April 3, 2015. ^ Winchester, Simon (February 27, 2005). "Exploration: Mad About the Mekong by John Keay". The Sunday Times. Retrieved April 3, 2015. ^ Osborne, Milton (December 1, 2007). The Mekong: Turbulent Past, Uncertain Future. Grove Press. p. 128. ISBN 9780802196095. Retrieved April 3, 2015. ^ Ollier, Leakthina Chau-Pech; Winter, Tim, eds. (October 19, 2006). Expressions of Cambodia: The Politics of Tradition, Identity and Change. Routledge. p. 61. ISBN 9781134171965. Retrieved April 3, 2015. ^ Gunn, Geoffrey C. (2011). "French Indochina: Ambiguous Colonisation – Unambiguous Nationalism". Journal of Contemporary Asia. 41 (3): 491–498. doi:10.1080/00472336.2011.582721. ^ "Postcards from the Edge of Empire: Images and Messages from French Indochina" (PDF). Asia's Colonial Photographies. International Institute for Asian Studies. Summer 2007. Retrieved April 3, 2015. ^ Powers, John (March 30, 2010). "Indochina: A Delicate Balance". Departures. Retrieved April 3, 2015. Mouhot, Henri (2000). Travels in Siam, Cambodia, Laos, and Annam. White Lotus Co, Ltd. ISBN 978-974-8434-03-2. Osborne, Milton (1969). The French Presence in Cochinchina and Cambodia: Rule and Response (1859–1905). Ithaca, New York: Cornell University Press. ASIN B000K13QGO. Tarling, Nicholas (2004). Imperialism in Southeast Asia. Taylor & Francis. Osborne, Milton (2000). The Mekong, Turbulent Past, Uncertain Future. New York: Atlantic Monthly Press. ISBN 978-0-87113-806-4. Garnier, Francis (1994). The French in Indo-China: with a narrative of Garnier's explorations in Cochin-China, Annam and Tonquin. White Lotus Co, Ltd.
Keay, John (2005). Mad About The Mekong: Exploration and Empire in South-East Asia. HarperCollins. Wikimedia Commons has media related to French Indochina. Wikimedia Commons has media related to Voyage d'exploration en Indo-Chine (Francis Garnier). Wikisource has the text of a 1922 Encyclopædia Britannica article about French Indochina.